The company reported a strong set of results in first quarter of 2018. Revenue increased 10.7% while Net Income increased 21.2%. EPS increased 17% to $0.62 and exceeded analyst estimates by 5.1%. While the traditional cable TV business is seen as a sunset industry, Comcast has been able to grow revenue even in this division in 2017 through its strategy of focussing on good content. The company is pursuing content growth not just organically but also through acquisition. Comcast also wants to buy the bulk of 21st Century Fox assets, which would give an exciting boost to its current business. Its film company Universal would end up with more movie franchises adding to its current plate of movie hits such as Minions, Jurassic Park and Fast and Furious. Other benefits of the acquisition include Fox’s sports network, TV network and a majority stake in Hulu, which streams content direct to consumers. 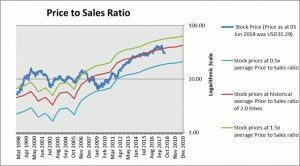 The Price Earnings (PE) Ratio is the most frequently used valuation indicator for a stock. However, there are times when this ratio cannot be used e.g. when the company reports a loss or profit is so minimal that it results in an abnormally high PE Ratio. We use the PE Band to show whether a stock is overvalued or undervalued based on its historical PE. At the price of USD31.29 as at 05 Jun 2018, Comcast Corp is trading at a Price to Sales Ratio of 1.7 times last 12 months sales. This is a 17.0% discount to its historical average Price to Sales Ratio of 2.0 times. At the price of USD31.29 as at 05 Jun 2018, Comcast Corp is trading at a Price to Cash Flow Ratio of 7.0 times last 12 months cash flow. 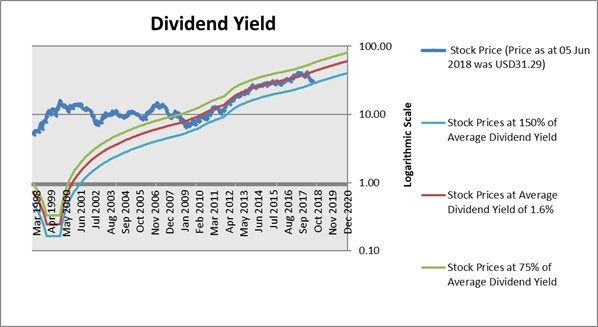 This is a 13.0% discount to its historical average Price to Cash Flow Ratio of 8.0 times. At the price of USD31.29 as at 05 Jun 2018, Comcast Corp is trading at a Price to Book Ratio of 2.1 times current book value. 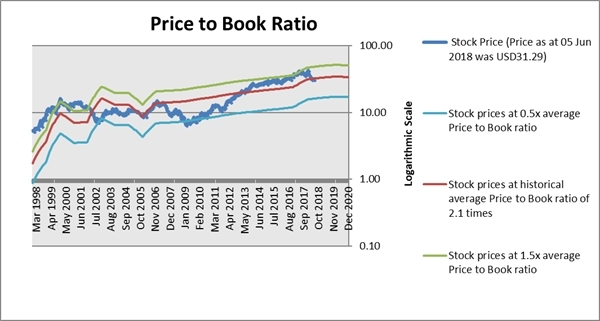 This is a 2% discount to its historical average Price to Book Ratio of 2.1 times. 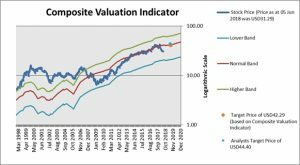 The Composite Valuation Indicator is derived using our proprietary method to put all the valuation indicators in a way that explains the stock price best. It recognizes that looking at a single indicator is dangerous and inadequate. It also overcomes the difficulty of different indicators pointing giving different signals and difficult to act upon if you do not have a composite valuation. 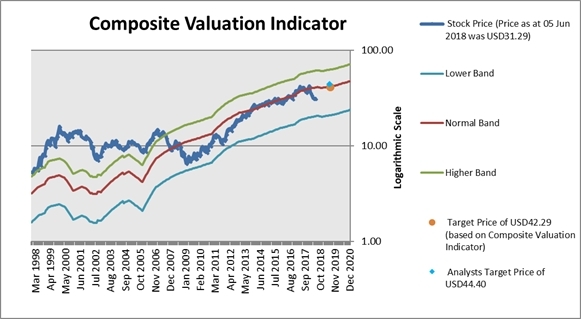 Our Composite Valuation Indicator does not assume that valuation stays constant at the average level. If the growth of the company slows down, it will adjust the valuation downwards to reflect the slower growth. Based on the Composite Valuation Indicator, the stock has a Target Price of USD42.29 within a 12-month period. Our Target Price represents upside of 35.2% based on stock price of USD31.29 as at 05 Jun 2018. 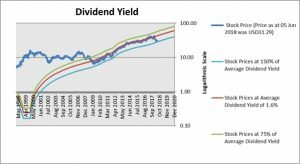 Since it is an ambitious target, we think it is good to take profit at around 25% from current levels. Of course, in deciding whether or not a stock is attractive, we need to consider other aspects of the stock such as earnings quality, financial condition, operational excellence, cash flow, technicals, etc. It is difficult to find a stock that is attractive valued and still pass every single criterion of the investor with flying colors. At times, we need to make certain trade-offs. For a full quantitative analysis, you could refer to this report.